The Aramaic incantation bowls from Sasanian Mesopotamia are the most important source we have for studying the everyday beliefs of the Jewish, Christian, Mandaean, Manichaean, Zoroastrian and Pagan communities on the eve of the Islamic conquests. In A Corpus of Syriac Incantation Bowls, Marco Moriggi presents new editions of forty-nine Syriac incantation bowls that were originally published between 1853 and 2012, with accompanying introductions, translations, philological notes, photographs and glossaries. Furthermore, there is a detailed analysis of the Estrangela and Manichaean scripts as used on the bowls, together with newly drawn script charts. In gathering, organising and updating most of the published Syriac bowls, this book provides a valuable resource for further research into both their language and content. JERRY PATTENGALE: How the 'Jesus' Wife' Hoax Fell Apart. The media loved the 2012 tale from Harvard Divinity School. (Wall Street Journal). In September 2012, Harvard Divinity School professor Karen King announced the discovery of a Coptic (ancient Egyptian) gospel text on a papyrus fragment that contained the phrase "Jesus said to them, 'My wife . . .' " The world took notice. The possibility that Jesus was married would prompt a radical reconsideration of the New Testament and biblical scholarship. Yet now it appears almost certain that the Jesus-was-married story line was divorced from reality. On April 24, Christian Askeland—a Coptic specialist at Indiana Wesleyan University and my colleague at the Green Scholars Initiative—revealed that the "Gospel of Jesus' Wife," as the fragment is known, was a match for a papyrus fragment that is clearly a forgery. It's a good sign that word of the latest developments regarding the Gospel of Jesus' Wife are being picked up by the mainstream media, even if in this case the article doubles as an advertisement for the Green Collection. Background on the GJW and the Harvard John fragment is here and links. Related post here. Using such sources, a deft modern forger has the essentials regarding script, orthography, vocabulary, syntax, language, and culture to produce a fine Old Hebrew forgery. All of these sources are widely considered standard in the field and are readily available; therefore, knowledge of, and access to, the proper resources is not an issue (and such sources are available for all the Northwest Semitic languages, not just Hebrew). Forgers also now have available software programs (e.g., Adobe Photoshop) that can be used to facilitate accurate "script production." Some of the remaining requirements would be adequate time; some knowledge of, or expertise in, chemistry or ancient metallurgy (or an associate with such expertise); access to various materials such as potsherds, ancient metals, stone of Levantine quarry, small pieces of ancient papyrus or vellum, some carbonized remains (for the production of "ancient" ink), and sufficient finances. None of these necessities is problematic. Because non-provenanced epigraphs often sell for thousands or tens of thousands of dollars, funding is not a major issue; that is, the sale of one forgery could fund the production of several additional forgeries. Moreover, ancient materials of various sorts are readily available to those participating in, or associated with, excavations or those dealing with the market. In addition, the chemical composition of ancient patinas can be replicated. I noted the article here back when it came out. Some of the many, many related PaleoJudaica posts are here, here, here, here, and here and links. Rollston's 2005 article demonstrates that long before the fake metal codices or the Gospel of Jesus' Wife emerged, specialists were well aware of the danger of forgers using ancient materials such as lead or papyrus to create fake artifacts with an appearance of antiquity. Good call, Chris. THIS WEEK'S DAF YOMI COLUMN BY ADAM KIRSCH IN TABLET: Why Did God Choose the Jewish People To Receive the Torah? Talmudic rabbis debate the paradoxical belief in Jewish chosenness despite the evidence of Jewish powerlessness. One famous midrash tried to come to grips with the problem by imagining that before choosing Israel God actually offered his Torah to all the nations of the Earth. But one by one they rejected it, finding its laws and prohibitions too burdensome; only the Israelites agreed to take it on themselves. This midrash, however, casts the law itself in a rather ambiguous light. It strongly suggests that the Torah is not exactly a boon—that it’s something an ordinary person would flee if possible. This doesn’t really suit the rabbis’ deep love and reverence for the Torah, which they see more as an inexhaustible gift. At the same time, the story puts the Jews themselves in a very flattering light: Only this people was pious and disciplined enough to accept the hard job of living by God’s law. ALIN SUCIU: Guest Post: Joost L. Hagen – Possible further proof of forgery: A reading of the text of the Lycopolitan fragment of the Gospel of John, with remarks about suspicious phenomena in the areas of the lacunae and a note about the supposed Gospel of Jesus’ Wife. He provides more evidence that the Gospel of John fragment is a fake. Dr. Hagen will be familiar to regular readers from this, this, this, and this. Background on the GJW and the John fragment is here and links. JOB: Teaching Fellow in New Testament, University of St Andrews -School of Divinity. A one-year post commencing 1 September 2014. Application deadline is 30 May. Follow the link for details. The Vatican library provides invaluable resources for Department of Classics professor Joseph Amar, but in the course of his study, he has worked to correct discrepancies in one of the library’s manuscript catalogs, he said. Using manuscripts from the first centuries of Christianity, Amar said he studies the writings of early Christian thinkers. Many of the manuscripts he studies reside in the Vatican Library, collected over many centuries and cataloged in the Bibliotheca Orientalis Clementino-Vaticana, an 18th-century tome that lists the authors of documents, their publication dates and descriptions of their contents, Amar said. He also studies the Aramaic language and its dialects, which linked Christianity and Judaism and, at times, made them almost indistinguishable. Amar said the process often leads to new discoveries. For example, scholars believed for centuries that Jacob of Edessa, an influential Biblical scholar, had written a commentary on the Book of Genesis ⎯ but no one could find it. Meanwhile, a catalog contained a misidentified Genesis commentary, Amar said. By comparing that manuscript’s writing and handwriting style with Jacob’s known works, Amar said he was able to correctly attribute the commentary to him. Finding a lost Syriac commentary on Genesis by Jacob of Edessa sounds like a big deal to me. The only other information given is the photo of Professor Amar, with what looks like a photocopy of the manuscript, with the caption "Classics professor Joseph Amar examines a copy of the commentary of the Book of Genesis by Jacob of Edessa. Amar said he believes this manuscript was published in the third century." Something is garbled there, because Jacob of Edessa was born c. 640. Perhaps he said that the Aramaic dialect Syriac spread from Edessa in the third century? The text in the photo appears to be written in Syriac script, but I can't make out anything else. Out of curiosity I flagged the article on the Hugoye list and Alison Salveson and Bas ter Har Romeny commented here. Cross-file under "Syriac watch," "Lost book found?" and "Watch this space." MARK GOODACRE gathers up all the latest on the Gospel of Jesus' Wife: Jesus' Wife Fragment Round-up. It is a good sign that CNN is taking note of the latest developments. On a tangentially related note, Brice C. Jones has an interesting and slightly disquieting post about the Green Collection of ancient manuscripts: On the Green Collection and Private Collectors of Biblical Artifacts. DISCOVERY: Hikers Find Human Skull and Bones in Gush Etzion Cave (Tazpit News Agency). A surprised group of hikers in Gush Etzion stumbled across human bones in a cave near Ein Tzurim, according to police. The hikers immediately called 100 (Israel’s 911), and the police came to investigate. The police, once on the scene realized that this wasn’t a murder scene and called the Israel Antiquities Authority. A preliminary examination by their experts indicate that the bones are apparently those of Jews from the Second Temple period. April DeConick: What are the facts about the Gospel of Jesus' Wife? April is asking some important questions, one or two of which I have also touched on here. There is a lot of interesting discussion happening on Facebook, especially from Mark Goodacre and Bob Kraft on the Philadelphia Seminar on Christian Origins page (which is a closed group). I hope some of it ends up in some public forum in due course. HAARETZ: Archaeologists baffled by 8th century BCE seal found in Galilee How the seal from Assyrian King Sargon II’s rule came to be found where it is remains unclear; ancient ring made of carnelian also found (Eli Ashkenazi). Two archaeological finds at the Omrit site in the northern Galilee have baffled Israeli archaeologists. The first is a seal dating back to the eighth century B.C.E., which was found in the "wrong" place. The second is an orange carnelian ring of uncertain origin, that apparently dates from the Middle Ages. The innermost part contains the most ancient temple, dated to the year 40 BCE. In the middle is a shrine dated to the time of Herod, around 20 BCE. Some believe that it is one of three temples Herod built in honor of Emperor Augustus, along with two others in Caesarea and Tiberias. The third, later, temple dates back to the first century CE. The seal, the older of the two artifacts, was found behind the wall of the earliest shrine, within a layer of filler between an internal and external wall. Archaeologists don't understand how the seal ended up there, as the temple was built roughly 700 years before the seal was created. The layer of filler also contained small glass tools and other objects which were apparently taken out of the temple during construction. The last paragraph baffled me for a while, since it's a bit difficult to explain an artifact excavated in the fill of a wall that was built seven hundred years before the artifact was made. A careless time traveler, perhaps? But as Joseph Lauer already independently worked out, this is just a typo. Read "after" rather than "before." It is unusual to find a prime artifact in a wall that is seven centuries younger, but time travel is not required. A MOLE BY ANY OTHER NAME ... Word of the Day / Khafarperet: The word that means mole but shouldn't, The sages didn't realize Israel has no moles. Hint as to what khafarperet might mean: It probably isn't fruit-digger (Elon Gilad, Haaretz). Rather more recently, a text of Isaiah [2:20] was found among the Dead Sea Scrolls, which in fact had the word khafarperet as a single word. But this doesn’t free us from the problem of what a khafarperet was, since as we already said - the Holy Land has no moles. There may not be moles but there are spalax, which are blind rodents that live in holes, also known as mole-rats. The zoologically challenged might be pardoned for thinking the delightful rodents are moles, since they look like moles, dig like moles et cetera. In modern parlance, when an Israeli sees a spalax (or more likely, a mound created by one), he'll probably tell you it's a khafarferet, not realizing that he's dead wrong and the species is actually a mole-rat, known locally as kholed. But that's okay, since that is probably what khafarperet originally meant anyway. It's always good when an even number of mistakes makes you right. FOR YOM HASHOAH*: Word of the Day / Yad Vashem Any bewilderment over the Holocaust memorial museum's name can be cleared up by the knowledge that 'yad' doesn't always mean hand (Shoshana Kordova, Haaretz). This use of yad, which means “power” and “strength” as well as “monument,” can be seen in the biblical description of a memorial to Avshalom, King David’s rebellious son: “Now Absalom in his lifetime had taken and reared up for himself the pillar, which is in the king’s dale; for he said: ‘I have no son to keep my name in remembrance’; and he called the pillar after his own name; and it is called Absalom’s monument [yad Avshalom] unto this day” (2 Samuel 18:18). There is indeed a stone tomb called Yad Avshalom (known in English as the Tomb of Absalom or Absalom’s Pillar) in Jerusalem’s Kidron Valley, though Israeli archaeologist Gabriel Barkay recently announced that it’s more likely to be the final resting place of Herodian monarch Agrippa I. *Israeli Holocaust Memorial Day, which was yesterday. THE GOSPEL OF JESUS' WIFE remains a live subject for now. First, Coptologists continue to comment on it and the reasons for concluding it is a forgery. Incidentally, if you would like to know more about the Lycopolitan dialect of Coptic, Peter Nagel has an informative online article at the Claremont Coptic Encyclopedia: Lycopolitan (or Lyco-Diospolitan or Subakhmimic). Second, David Meadows is starting a new Papyrus Series over at Rogue Classicism. It will be on recent papyri discoveries and it sounds as though the GJW and the the new Sappho papyrus will receive attention in due course. The series begins with The Papyrus Series I: Egyptian Soldier Letter Home. Third, I've been meaning for a while to note a blog post at Faces and Voices by Roberta Mazza on the legal issues of dealing with unprovenanced fragments like the GJW and the Sappho papyrus: Papyri, private collectors and academics: why the wife of Jesus and Sappho matter. Background on the GJW is here and links. DR. INGRID LILY has set up an interesting website on the Noah movie called Noah's Flood. It collects essays and media by scholars and writers. I don't think I've mentioned it before, so have a look. Background on Noah is here and links. 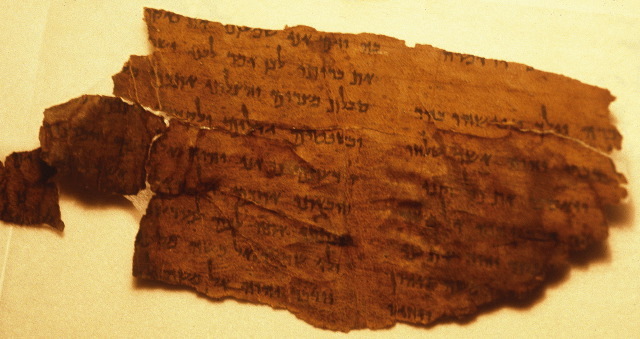 ANOTHER BLOG SERIES BY LAWRENCE H. SCHIFFMAN: Exile and Return in the Dead Sea Scrolls (2 posts).